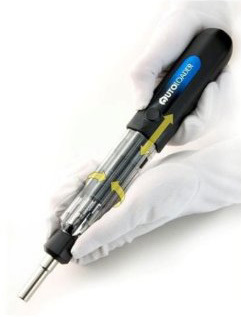 Autoloader Screwdriver Makes Changing Bits A Breeze | OhGizmo! Announcing The Winner Of The Vuzix Eyewear AV310! How is it that whenever you open up your toolbox to get a screwdriver, the exact one you need is missing? It’s probably because someone’s been too lazy to put them back when they are done (that would be my issue). That’s why screwdrivers with interchangeable bits can be so handy. Of course even those little bits can get lost, which is why this Autoloader Screwdriver from KR Tools looks so enticing. The Autoloader has six different bits (three Phillips and three flathead) built right into the handle. When you want to change the one you’re using, you just pull the handle, twist it to select the right one, then push the handle back into place. You never actually have to touch the bits themselves, thus you’ll never lose them. Of course now you just have to remember where you set the screwdriver. You can pick up a 2-pack of these (one large, one small) for just $30. I like this. I am always missing bits. I like the idea, I wonder how durable they are. Maybe a great Christmas gift for a certain mechanic I know. I love getting him the newest things. Like Wrenchmints. I got him a box before they came out to stores by contacting the owner of the company. Amazing Christmas gift. Even with this you would have to buy a lot of them to get the bit sizes you need, and it's not like they make these for electronics, I'll stick to my individual drivers thanks though. These are for novelty use. This isn't a screwdriver that can be used too much. I had one just like it and what winds up happening is the metal column in the center gets warn and breaks away from the screwdriver handle. Good for small jobs but if you have a tough job that requires you to a lot of torque, this won't last long. My concern is that this thing might be less than sturdy or jam up like an M-16 in a rice patty full of VC. I appreciate it but I'm not a mechanic Jess. im not a big fan of these types of screwdrivers. if your problem is your always losing the screwdriver you need then having all six of your screwdrivers in 1 handle would make it so much easier to lose them. Well that's when you whip out the AK we all know your carrying under your pack and just spray and pray you find a hole to run through. I like the idea, but do I have to wear those ridiculous gloves when I use it? I'm going to have to order one of these. The absolute worst thing possible is trying put up a door by yourself and drop the bit from the screwdriver. However, it is a good opportunity to make some former navy people blush. I'm going to go with dropping and then when you fetch it having the door fall on you is worse.. If you don't wear then gloves the police will know who to come after when you get pissed off at it, throw it out your window and accidentally kill your elderly neighbor. well that sounds like a personal problem charlie.